Battlefront II’s campaign is the best official Star Wars story in years. Ok, I have to come clean and make a couple of admissions. First, I was one of those folks who were greatly disappointed that Star Wars: Battlefront (2015) shipped without a campaign mode. I mean, seriously? How do you make a gorgeous Star Wars game and then ship it without a playable story to experience?! It seemed like a ludicrous situation; a grand oversight. Partially because of that, even though I bought SW:BF on Day One, I never played it that much. I enjoyed the offline missions from time to time, (the Speeder Bike sequence on Endor in first person mode is still amazing), but overall it remained primarily on the shelf to keep my bookcase company. 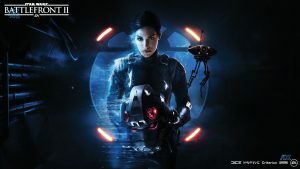 I was (most likely) going to buy Star Wars: Battlefront II (2017) no matter what, I’ll admit it. Once I heard it had a campaign mode, though, I was sold. Which leads to my painful second admission. I bought this game also on Day One, November 17, 2017, and although I did the first Mission (the prologue “The Cleaner”) when I originally got the game, I didn’t actually, really play the campaign until April 26, 2018. So after deciding to finally just play the darn thing two weeks ago, this past weekend I completed the whole campaign (the main story as well as the three-chapter “Resurrection” DLC epilogue). As I was going about my day today, the wonderful story that developer Dice created for Battlefront II continues to float around in my head, and for very good reason. The campaign’s story line in the Battlefront II video game is far superior to the script for the movie The Last Jedi, and really even The Force Awakens. But what is it that this game got right that Hollywood keeps getting wrong? Let’s take a (spoiler free) look. Iden Versio’s nobody’s fool. She’s Star Wars’ best written female since Leia, and character to wear black since Vader. One of the things you’ll feel right off the bat that Star Wars: Battlefront II knows how to do is to tell a story that can live within the classic original and the final Skywalker trilogies. It does so seamlessly and naturally, without aping what those who came before them, like George Lucas and Lawrence Kasdan, have already done. For example, early on in the game the main character Iden Versio and her commandos, Del and Hask (sorry, not Biggs and Wedge, Star Wars/Final Fantasy fans) arrive on Endor right before the Rebels blow up the second Death Star, as seen at the end of the film Return of the Jedi. Their purpose for being there feels natural (essentially, stop the Rebels), and its an exciting new angle to see how the Imperial Officers on Endor would have reacted to watching their Death Star II explode in the sky right over their heads. Dice didn’t create a new forest-like world and populate it with “Ehwalks,” knock-off cousins of the Ewoks. They had a legitimate reason to be on Endor and so that’s where the game puts them; interacting within the story as it already exists in The Return of the Jedi. None of this incessant one-ups-manship The Force Awakens and The Last Jedi are rampant with. The game primarily takes place following the Emperor’s defeat at the end of Return of the Jedi, and you will journey to other famous locations, such as Bespin, and see how they are continuing to exist in his absence and at a time when the Empire’s hold on the galaxy is waning. There are, of course, those Missions that will feel a bit more like they were designed solely to be an opportunity (or excuse, depending on your point of view), to take control of classic characters such as Leia, Han, and Lando. To me, this felt like it had more to do with a desired necessity of making the player familiar with how the character plays and less like something that lent itself to the overall design of the story. It should feel natural to pop from one characters viewpoint to another, like how it happens in film and television, but for some reason in the game it felt more like “Ok, now here’s a Mission where you get to play as Han to see how he plays!” It wasn’t bad in anyway, it just felt weird at times to me. I don’t know why these transitions felt like bumpy segues, perhaps it’s just because I’m used to generally always playing as the same character in a video game, and to swap between them in a campaign felt awkward to me. Who knows, but I’ll admit this might be my own personal hang up. Or maybe I’m just bitter because they don’t let you play as Shriv. If there could be a breakout character in a video game, Shriv Suurgav is such a character. There’s an infiltration Mission found later on in the campaign pairing newcomer Shriv with our favorite debonair pirate, Lando Calrissian. The Shriv and Lando Mission was possibly my favorite in the game mostly due to the fact that the pessimistically deadpan Shriv plays off so well against the optimistically jovial Lando. The dialogue between the two characters was fantastic, making that chapter I believe feel the most fun out of all of them. And speaking of dialogue, whoever wrote Shriv, who’s portrayed expertly by Dan Donohue, did an amazing job as he had me laughing the entire game. Kudos to Mr. Donohue’s acting and to the writers that give him such great material to work with. 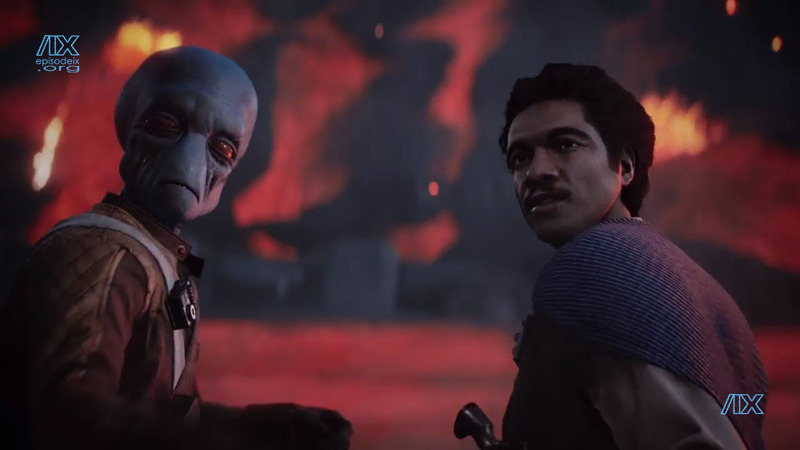 Shriv and Lando, the Felix and Oscar of the Star Wars universe. Back to the campaign’s story though, as I said earlier, I find myself reflecting on it after having spent a few nights over the past two weeks working my way through it. Even with its hiccups, including the annoyingly distracting “Collectibles” to find that are scattered throughout over half the game (which I honestly wish they left out as it broke the illusion of immersion), I was invested in the overall story and wanted to truly see what happened next. This is the total opposite of how I, and I think a more and more people as time goes on, are starting to feel about Disney’s rapid-release schedule for their Star Wars movies. The new movies are getting produced and released at such a breakneck pace that the stories are not completely baked and they’re just riding through the box office on their special effects and name recognition alone. Look, I’m pretty sure that you could put out a movie of Mark Hamill off-screen on speakerphone reading through the phone book for 90 minutes and that flick would make hundreds of millions of dollars (“Star Wars: The Dialing of the Jedi”), but is it actually worthy of the franchise to receive those millions? Nostalgia and brand loyalty will only bring people to the theaters for so long until they feel they’ve been burned enough times (Transformers, I’m looking at you). The point is, just because the movie is “successful” doesn’t mean it’s a great movie, and just because a game gets picked apart for every little thing by people online doesn’t mean it’s a “failure” or “garbage”. Whereas The Last Jedi worked it’s hardest to destroy the franchise and got accolades, Star Wars: Battlefront II honors where it comes from but I feel like its fantastic story-driven campaign has been overshadowed by people complaining about loot boxes and “what they want” isn’t in the game. Too many people fail to realize the immense amount of work that goes into games like this, and this game has one of the greatest Star Wars stories told in years; regardless of if it’s in a movie, a game, or a book. It’s a shame to think about how many folks have forgone or will miss out on the tale that Dice has lovingly constructed. Iden’s riches-to-rags story had me engaged the whole time, and when the main campaign ended, I was sad to see it go. I tried to put off the “Resurrection” DLC for as long as I could, an artificial attempt to stretch the game out, but I enjoyed the story so much that I couldn’t wait. After a few days I went right back to it and knocked it out over two nights, leaving the final chapter for its own night to bask in the dying embers of the tale’s fading light. Which brings me to the point of what a great job they did with the player’s immersion in this story. It’s nearly impossible to stop playing it as the Missions never feel like they end. The game is technically broken up into about a dozen different Missions, but as if you’re experiencing a movie it just keeps going without any breaks or “end level” tallies to give you a breather. Before you know it, you’re just flowing through the game from Mission to seamless Mission until you have to force yourself to say, “Alright, that’s enough for tonight. I am literally quitting this game in the middle of this character talking as I have to get up off this couch.” I’d expect that this feature is something becoming more common in massive story-driven games, like maybe the new God of War, but I don’t know for sure. I think Terminal Realities Ghostbusters: The Video Game (another excellent game) played out like this, but it’s been nearly a decade since I last played it so I can’t recall for sure. I just know that there was something about Battlefront II that felt extra buttery-smooth and kept me completely engaged with the game the whole time, making it hard to quit out and get to bed. This is a sensation I didn’t feel at all with The Last Jedi. About halfway through TLJ, my wife and I started looking at each other wondering what the heck was going on. Not in a confusing way, mind you, but rather in a “Am I really watching this? !” kind of a way. The movie just continued to feel more and more like a parody of Star Wars as it went on through its excruciatingly long running time of nothing truly happening. Rey feels the force…of Rian Johnson instantly obliterating everything she represented as an intelligent, strong woman at the burnt croissant hand of The Man. When people ask what I thought about TLJ, I often tell them I think it’s a bad movie. I quickly follow that up with “It’s not a bad Star Wars movie, it’s a bad movie“. There was no great story to be had, it jumps around all over the place, and many characters spend their time being completely useless for two and a half plus hours. It was a tremendously wasted opportunity. I don’t want to get into breaking down my thoughts on TLJ here and now, but suffice it to say there wasn’t really any scene/s that I felt invested in or any story line I wanted to see how it ended for any reason other than the one where I got to get up and finally leave the theater. I did not experience that at all with Star Wars: Battlefront II. Without giving anything away to those who have yet to play it, there is a cinematic scene that takes place right at the end of the first Mission, “The Battle of Endor”, that had me hooked. Once I saw it, I knew that the people making this game loved Star Wars and wanted to honor its rich mythos; unlike Disney’s approach with the franchise in their authorizing of the tearing down and throwing away everything that made Star Wars fans fall in love with it in the first place. The old adage often rings true – If it ain’t broke, don’t fix it. Sadly, it seems more and more that that’s what Disney is continually forgetting, but what Dice understood and executed upon marvelously. If you don’t have the ability to play the game, there is a fan who edited all of Star Wars: Battlefront II’s cinematic and story-driven moments together into one cohesive video that you can watch to enjoy it as well. I always recommend for folks to actually play through the campaign to really, fully experience Iden’s journey if possible; but if you can’t, thanks to YouTube user Yic17, you can click here to watch STAR WARS: Battlefront II – The Movie (2017). I hope you enjoy this great Star Wars adventure as much as I did, however you experience it. And Dice, don’t make me wait too long for your next Star Wars campaign, whatever it may be. The Force is strong in this one! Previous Post: We’re on the right ‘track! Next Post: Happy 41st Birthday, Star Wars!